Spoiler Alert: I assume most people have already seen these films, as a result I discuss the plot as much as I can. I will not try to go into every detail but generalize as much as possible. The opening credits of the film ‘When Saturday Comes’ (not to be confused with the popular Magazine) show the bleak and desolate Sheffield landscape comprising of factories and pollution. In the latter stages of these opening credits we see a young boy juggling a football in this environment. As the film starts, we see the same young boy with a Guidance counselor of sorts at his school. The young boy has dreams of becoming a footballer, but the school official immediately quashes his dreams by informing him that if he had the talent he would have been picked up at schoolboy level years before. The official then bluntly tells him that his only choices are either working in the mines or in a factory. Years pass and now we see our protagonist as an adult. Sean Bean (real life Sheffield United fan), who has been in a myriad of Hollywood movies playing anything from a James Bond Villain to more sympathetic characters, plays the central character. Jimmy Muir, a local lad, with dreams of football glory. The adult Jimmy Muir is still living in the same neighborhood with his family, His biggest supporter is his younger brother Russell, who is an avid Match programmes collector and works in the mines just like their father. Jimmy and Russell’s father is the clichéd bitter and miserable old man. He is a hard drinker, gambles and makes Jimmy’s kind mother suffer with his behavior and demeanor. He also takes every opportunity to belittle Jimmy for his football dreams, although that does not stop him from asking money from his sons (it is implied that he needs the money to pay off bookies for his gambling habit). As expected Jimmy works in a brewing factory, where he gets along well with his buddies, who are also his teammates in the local team. Of course, their supervisor at work (as film cliché would have it) is another bitter man on a power trip, who is the bane of Jimmy and his friends’ existence. Jimmy and his friends from the Brewery, usually play in front of a handful of supporters standing on the touchlines in a field near a cemetery. Jimmy is the star of the team and their main goalscorer. Naturally, she catches Jimmy’s eye and they go on a date. Since this is a film and we are pressed for time, one date is sufficient for the pair to fall in love. Afterwards at one of Jimmy’s matches, we are introduced to the character of Ken Jackson (played by the late great Pete Postlethwaite). He is the Manager of Non-League side Hallam. He is impressed by Jimmy’s talent and offers him a place on his team. It turns out that Ken Jackson is also Annie’s uncle. He does well in his new team, and Ken, who has connections with the local giants Sheffield United, arranges a trial for Jimmy with them. 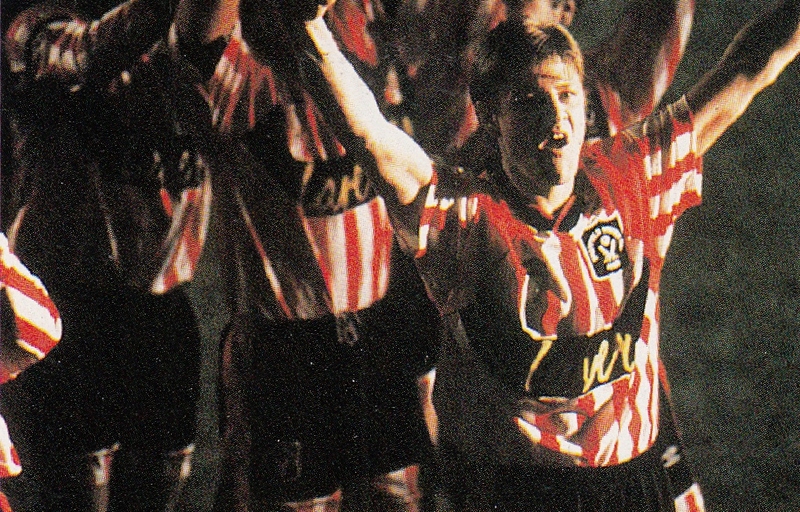 Former professional player, Tony Currie plays himself as the Sheffield United’s Chief Scout. Jimmy impresses enough in the trial to earn a second trial under the presence of the head Manager for a final decision. It is at this point where things are seemingly going well for Jimmy that his problems start. He is fired from his work at the Brewery after he punches his supervisor, after continuous verbal abuse. Things at home are just as complicated, as his father’s gambling and boozing has made life at home unbearable especially for Jimmy’s mother. His father even resorts to selling Russell’s prized Football Match Programnes without his knowledge. The relationship with Annie has also entered a new phase. She suggests that they should look for an apartment to live together. Jimmy deduces that she is pregnant, but he tells her that he does not want a child and is not ready for a family. On the eve of his crucial trial, he is out with his friends for one of their birthdays. Despite initial refusal to drink alcohol, he is roped into it through peer pressure (or perhaps still depressed after the earlier incident with Annie). Needless to say, he drinks all night and even sleeps with a stripper. He arrives at the trial under the watchful eye of First team Manager George McCabe (played by James McKenna), along with Tony Currie and Ken Jackson. He is completely out of sorts and makes a mess of his trial. Once the Manager smells Alcohol on him, he dismisses him on the spot. To compound on his misery Annie also breaks off with him, after being informed of his infidelity with the stripper. As if these troubles were not sufficient, events turn significantly more tragic after his younger brother Russell is killed after an accident at work in the mines. It is at this point (as seen in countless other films) that our hero decides to clean up his act and redeem himself. He gives up alcohol and asks Ken Jackson for a second chance. He starts training individually (reminiscent of Rocky). We see him doing sit-ups, running, etc. He also tries to win Annie back by persistently writing her letters. Ken Jackson is overcome by his dedication and agrees to help him train and get another shot at Sheffield United. After continuous persistence, Annie finally reconciles with Jimmy. He also somewhat reconciles with his father, who tearfully admits that his anger and bitterness is due to the fact that he could not stand to see his own succeed because of his own failings. It is left for Ken to convince the Sheffield United Management for another shot at a trial for Jimmy. After doing so, Jimmy impresses in the trial and wins a spot on the first team. He is restricted to the bench in the early going, waiting for his opportunity. Sheffield United are scheduled to play the mighty Manchester United in the semifinals of the FA Cup. Predictably they fall behind and seem to be eliminated. Due to an injury, Jimmy finally gets his long awaited chance to play and comes in as a substitute at halftime. Annie and Ken are at the stadium cheering, while his friends watch in disbelief in a local pub. After some early difficulty he gets into the game and scores the tying goal to make the teams even (2-2). With a minute left, Jimmy is elbowed in the box and Sheffield United are awarded a penalty kick. He is tasked with the ensuing penalty kick. The sequence is shot after a long pause in slow motion for dramatic effect (as if we had any doubts about the outcome). He scores, they win, everyone celebrates and THE END. 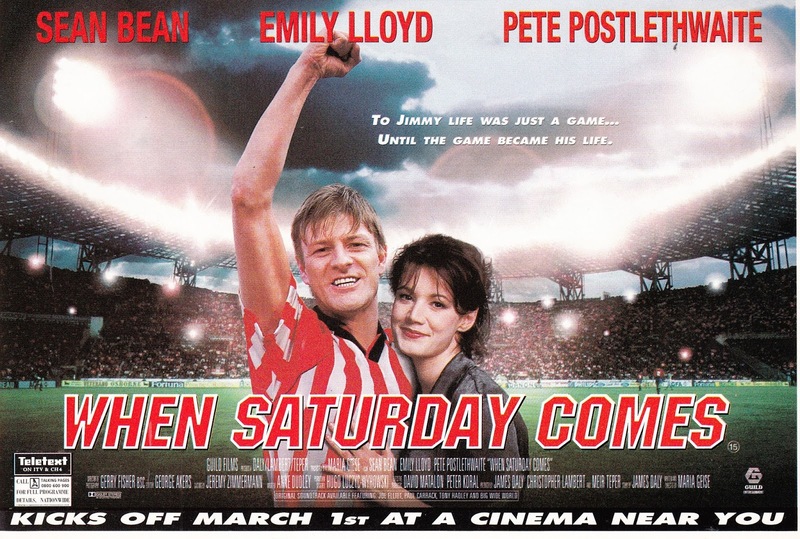 This film was released in 1996, at a time when the Premier League was in its early stages of becoming a global brand. The ending (as clichéd as it is) feels a little flat with no satisfactory epilogue. The audience assumes that Jimmy is on his way to make it big, but the film ends just as soon as the winning penalty kick is taken. As far as the penalty kick itself, that sequence is also baffling. It seems inconceivable that he would be assigned to take the penalty kick. He is literally the least experienced player on the field with not even a half of top-flight football behind him. It seems like in basketball, where the fouled player is assigned with the free throws. Apart from that, the film follows sport movie conventions of rags to riches and is predictable at almost every turn, most notably with the whole redemption narrative and winning back your love. 1- Former Professional player Mel Sterland, who played the Sheffield United Captain in the film, actually had a long and distinguished career with city rivals Sheffield Wednesday. 2- Some have suggested that Sean Bean, who was well in his thirties, as too old for the role (although his character was supposed to be 25). 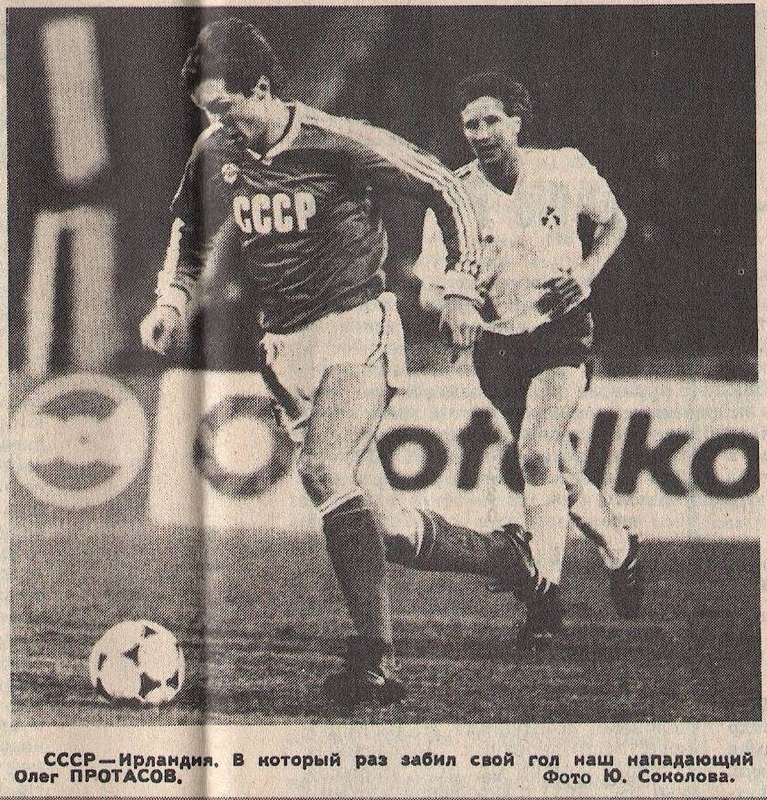 Following USSR’s elimination from qualifying to the Finals of Euro 1984, the Soviet Authorities dismissed The Manager Valeri Lobanovsky. The new man in charge that they appointed was former Dinamo Minsk Manager Eduard Malofeyev. 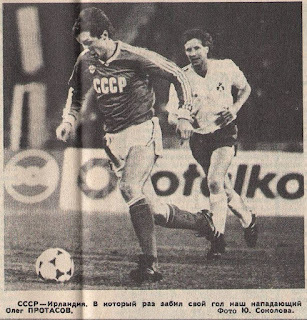 He had led Dinamo Minsk to the Soviet League Title in the Fall of 1982 and now his mission was qualification for the 1986 World Cup in Mexico. 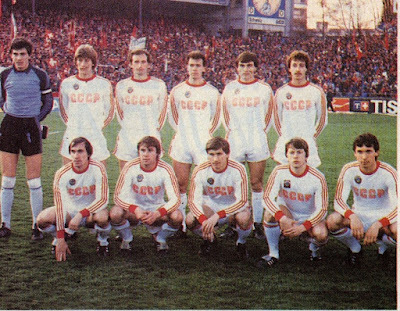 Malofeyev could still call upon the backbone of the team that included players from Spartak Moscow (goalkeeper Rinat Dassayev, Yuri Gavrilov), Dinamo Tblissi (Chivadze, Sulakvelidze), not to mention the Dinamo Kiev contingent (Baltacha, Bessonov, Demiannenko, Blokhin). Many of his former Minsk players (Aleinkov, Gotsmanov, Zigmantovich and Kondratiev) now had opportunities in the new regime. 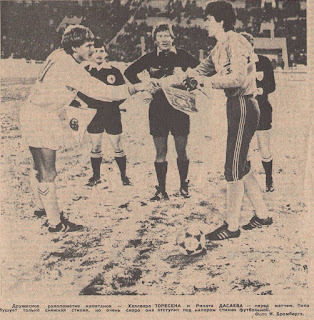 Dnipropetrovsk pair of Gennadi Litovchenko and excellent striker Oleg Protasov were also now in International reckoning after helping Dnipro win the Soviet League title in the Fall of 1983. 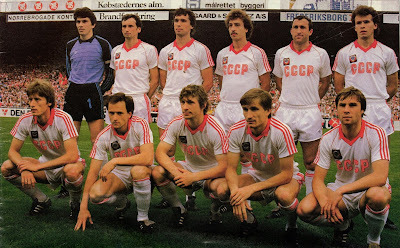 USSR played a number of friendlies in 1984 in preparation for the World Cup qualifiers that would start in September. They lost to West Germany (March 28, 1984, 1-2), but defeated Finland (May 15, 1984, 3-1) and Mexico (August 19, 1984, 3-0). Their best display was in defeating England at Wembley (June 2, 1984, 2-0). Malofeyev experimented in these matches and included many of the aforementioned new Dinamo Minsk and Dnipro players. 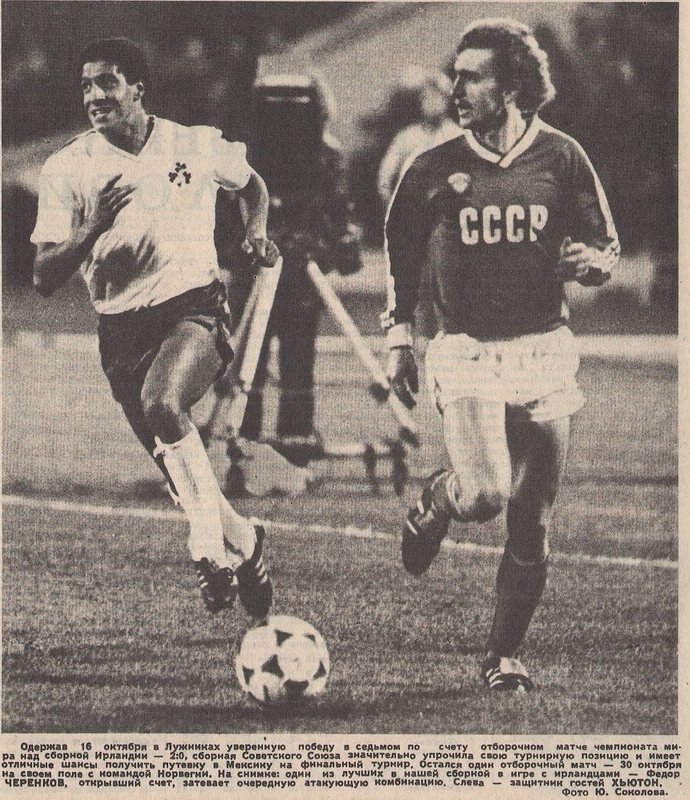 Their World Cup qualifying group included Denmark, who had surprised everyone during the 1984 European Championships. The others were Republic of Ireland, Switzerland and Norway. The World Cup qualifiers started on September 12th with an away trip at Dublin to face the Republic of Ireland. The hosts won this hard fought match (1-0). In general the Soviets would find traveling difficult for these qualifiers. 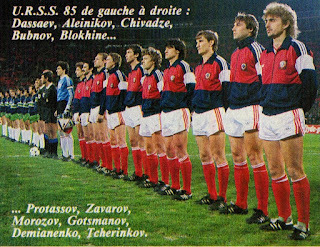 The second match at Oslo vs. Norway on October 10th was also disappointing as the Soviets could only manage a (1-1) tie. 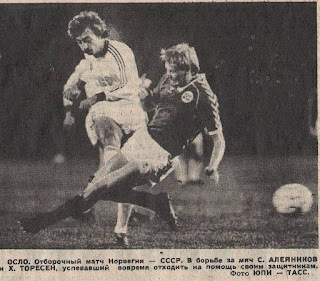 Litovchenko replied with a goal in the 74th minute, after the Soviets had gone behind twenty minutes earlier to a Hallvar Thoresen penalty kick (awarded after Rodionov had fouled Thoresen in the box). 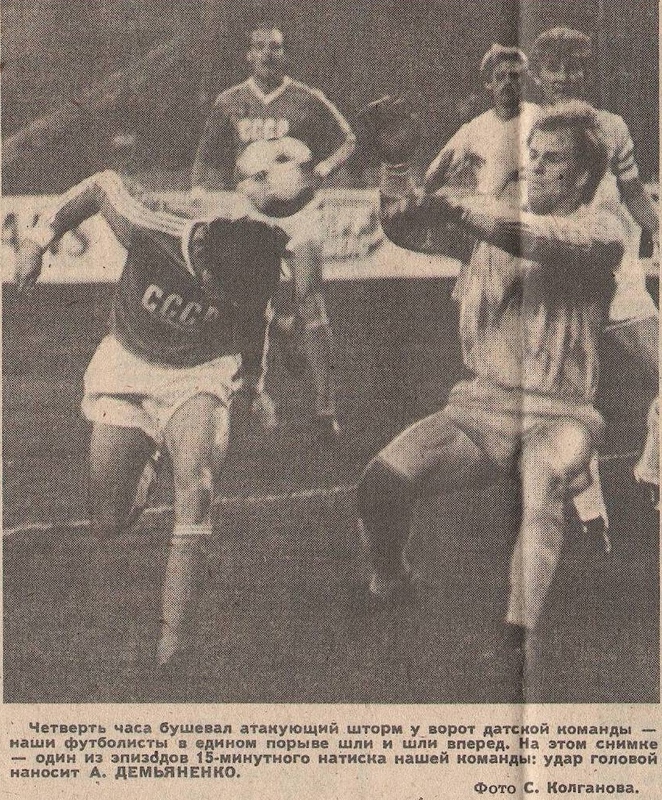 For this match at Norway, Oleg Blokhin had been dropped. Officially, it had been stated that his unavailability was due to injury. Many believed it was because he had quarreled with his teammates. In the New Year (1985), Malofeyev took the squad to participate in the Jawaharlal Nehru Cup in India. They came back victorious after wins vs. China, Iran, Morocco and a Final win vs. Yugoslavia. 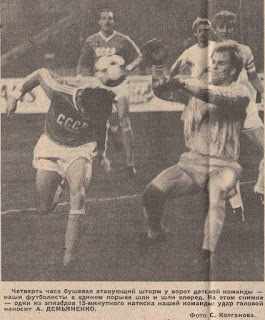 In preparation for the away qualifier at Berne vs. Switzerland, the Soviets took upon Austria in a friendly at Tblissi and won (2-0). 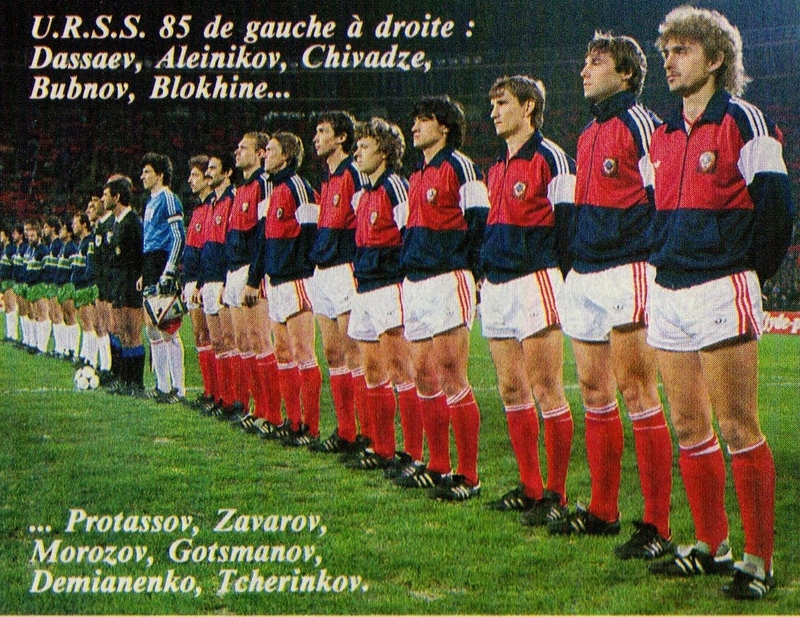 After two disappointing away performances, the Soviets were eager to come away with a positive result vs. the Swiss. They seemed to be headed to a rare away victory after Demianenko had given them the lead with ten minutes remaining. However, Andre Egli scored Switzerland’s equalizer at the death to deprive the USSR of its first win in the group. Two weeks later they faced the same opponents on home turf. 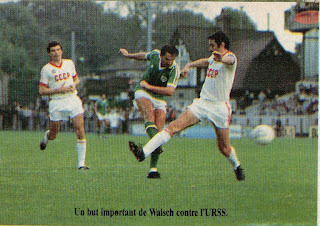 Malofeyev had vowed they USSR would play an attacking game at home. They tore apart Switzerland and scored four goals (two apiece by Protasov and Kondratiev) in just the first half. 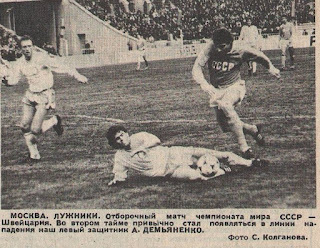 Future Ballon d’Or winner Igor Belanov made his debut for the Soviet Union by coming on for Litovchenko with ten minutes left. On June 5th, they faced the impressive Denmark squad at Copenhagen. What more can be said about one of the most referenced matches in the history of Football. This match has gone down as a perfect example of attacking and attractive Football being played by both teams. 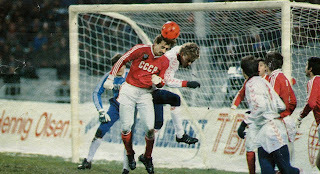 Denmark won (4-2), but despite the loss, the Soviets were praised for their approach. 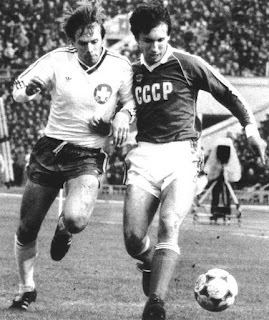 The Soviets started the final phase of the qualification with preparatory friendlies vs. Romania and West Germany in August (both won by them). Alexander Zavarov made his debut for National team in the match vs. Romania. Oleg Blokhin was now re-integrated back into the squad after having fallen out with his teammates the previous year. On September 25th, they took upon group rivals Denmark in Moscow. The high scoring Oleg protasov was the difference as they won this key match to inch closer to qualification. The Soviets were to close out the qualification matches in the month of October at home vs. Republic of Ireland and Norway (within two weeks of one another). The Irish (surprisingly good away from home) were defeated (2-0) with once again Protasov amongst the scorers. At the end of the month, they defeated Norway (1-0) with a goal from Kondratiev in very cold temperatures. They qualified for the World Cup Finals along with group winner Denmark. 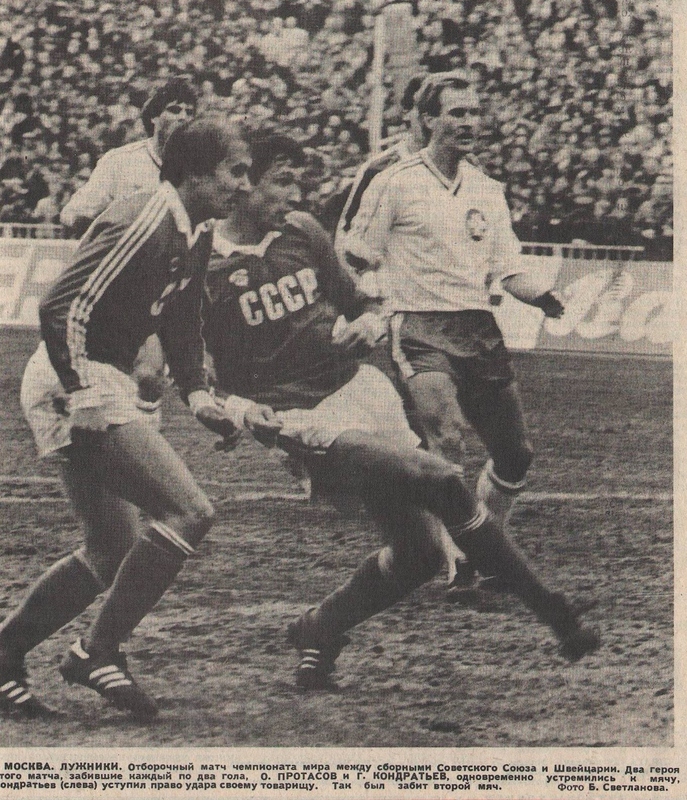 In the New Year, the Soviets took part in customary friendly matches in preparation for the World Cup. 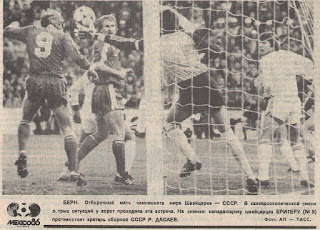 The results were disastrous as they successively lost to Spain (January 22, 1986, 0-2), Mexico (February 19, 1986, 0-1), England (at Tblissi, March 26, 1986, 0-1) and Romania (April 23, 1986, 1-2). The authorities fearing a disaster at the World Cup, removed Malofeyev from his post and re-appointed Valeri Lobanovsky as National Team Manager. Lobanovsky flooded the squad with his own Dinamo Kiev players and installed Belanov and Zavarov in leading roles. 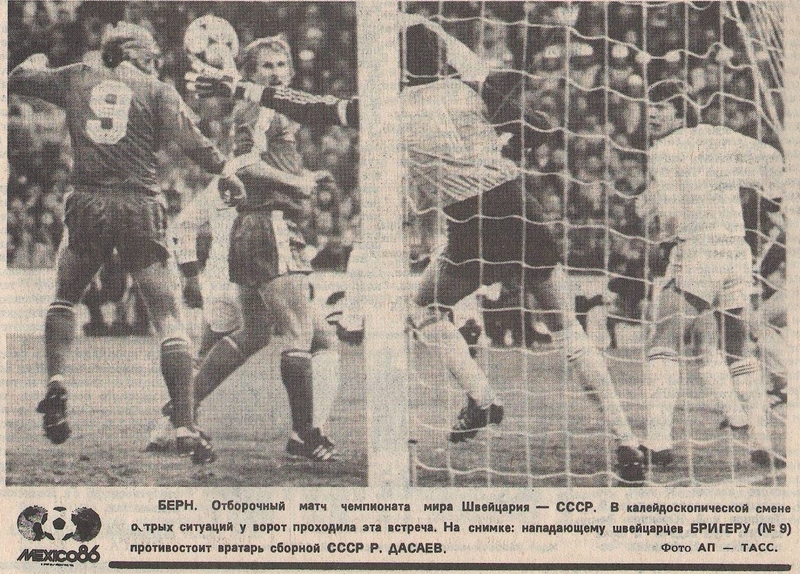 The Soviets were impressive in the first round of the Finals, which included the (6-0) hammering of Hungary. They were eliminated in the second round by Belgium (3-4). 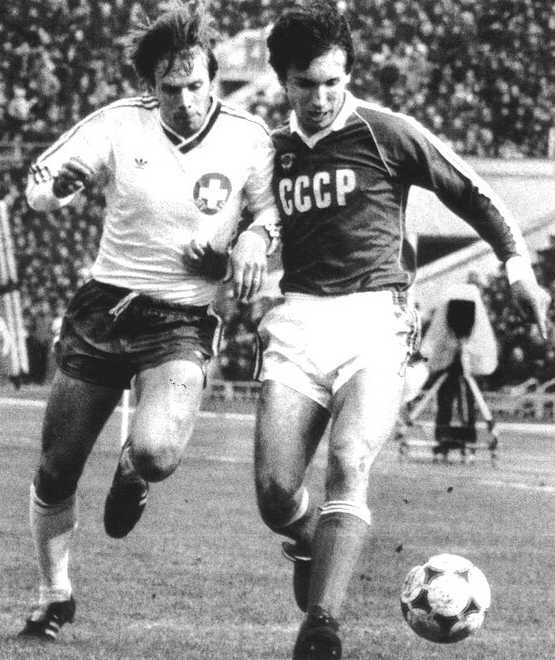 Igor Belanov and Alexander Zavarov’s performances earned the former the Ballon d’Or and the latter the Soviet Player of the year Award.